This is Dyslexia Awareness Week and, as one of Sir Jackie Stewart’s Dyslexia Scotland Ambassadors, I want to do something both to mark it and promote Dyslexia Scotland. Dyslexia Awareness week and Ellie’s Blue Ribbon campaign – and find links to order blue ribbons and download a poster for your school, library or office. Please consider joining Dyslexia Scotland – here. Take a look at our new YouTube channel. The ones so far include one about our Hebrides road shows, the Education conference and one with Steven Naismith talking about DS being the Scottish Football Association’s nominated charity for the next 2 years. 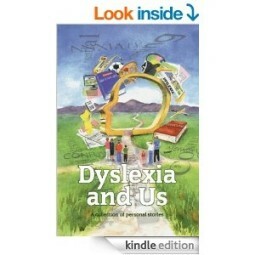 And PLEASE buy Dyslexia and Us, a heart-warming and eye-opening collection of experiences from people with dyslexia. The print version is a wonderfully reasonable £5.99 and the ebook a mere £2.99. I’ve committed myself to promoting this book so please help me by buying it! All proceeds to Dyslexia Scotland. And Little Gems are Barrington Stoke’s new series of quality first chapter books from author/ illustrator dream teams and the latest ones are even in colour! In a gorgeous chunky format with flaps, these quality stories are specially designed to help every child establish good reading practise and also have dyslexia friendly features. Keep up the good work, Dyslexia Scotland and Barrington Stoke! And remember, PLEASE buy the Dyslexia and Us book if you want to help Dyslexia Scotland support people with an often really difficult and life-changing condition. Please spread the word about the competition, Barrington Stoke and Dyslexia Scotland. The simplest way is to share this post on your social networks. Thank you!